Isorads (contours) showing the annual average daily solar energy available (in MegaJoules per square metre per day, MJ/m2day) for a fixed solar collector facing north and tilted to the latitude angle for near optimum year round performance. By way of example, the solar energy available in western Victoria on an average day (18.1 MJ/m2day) would provide about 1 kWh (kiloWatt hour) of electricity through a commercially available system comprising a small battery bank and two square metres of solar panel with an overall efficiency of just 10%. This is ample to light 4 rooms for 10 hours each using fluorescent lighting of either the compact or conventional tube designs. Energy from the sun can be used to generate electricity (solar-electric), or heat (solar-thermal). Victoria has excellent solar resources, for example, Mildura receives 90% of Brisbane 's solar radiation levels. Victoria's average yearly global solar exposure on a horizontal surface ranges between 12-20 Megajoules per square metre per day (MJ/m2/day). Annual solar radiation levels range from lowest (dark blue) to highest (red) across Australia. The average amount of sunshine received by the various regions of Australia is mapped with the regions receiving the fewest number of hours represented by dark purple and the regions receiving the most number of hours shown by yellow. 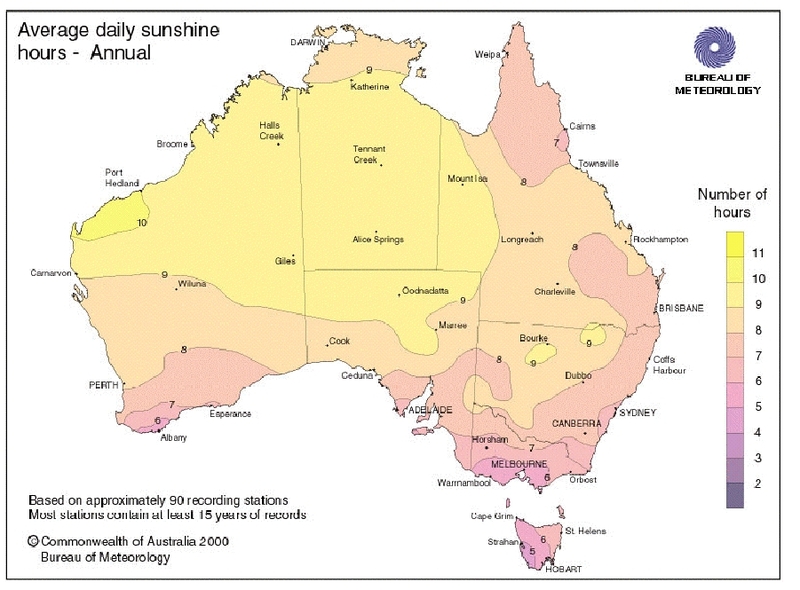 This map demonstrates the amount of solar radiation Australia experienced on September 1, 2009.